Today 12th of June the Hong Kong Observatory upgraded the typhoon signal from No?1 to No?3 at 10.40am as Tropical Cyclone Merbok approached the city. Change to signal n.8 is possible depending on typhoon’s movement and intensity. 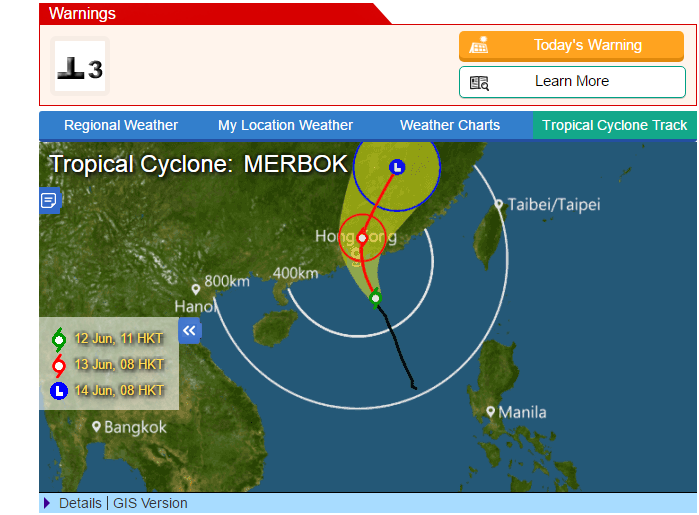 According to the current forecast track, Merbok is expected to make landfall within 100km of Hong Kong at about midnight tonight June 13th. We remind you that with warning signal no.3, all the operation at the port and airport will drastically slow down. While for Typhoon warning signal no. 8 and above, airports, ports and offices are closed for safety reason.